Random vibration testing is intended to verify that the device under test will withstand the vibration and perform to specifications afterward. Accuracy of signal generation, signal measurement, filtering and control algorithms are required to ensure accurate test results. View all of your spectra on demand. 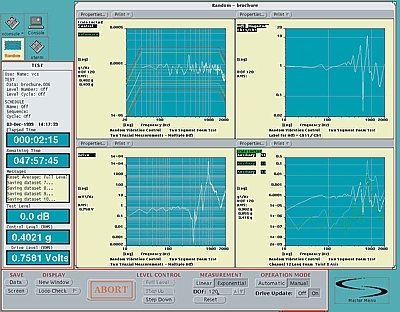 Testing large structures that possess closely spaced, highly responsive resonant characteristics poses a severe challenge to a digital control system.